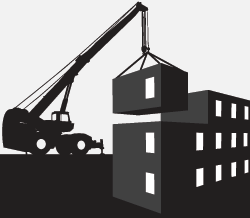 4More space are modular and portable building experts with over two decades of experience. Our bespoke steel framed buildings offer flexibility, economy, and durability that cannot be matched by traditional building methods. We are able to achieve much greater heights and longer spans than conventional systems. Space is very important to many businesses. Mezzanine floors and viewing balconies can also be incorporated, to give a much greater floor area for productive use. Flexibility in the siting of doors, windows, roof lights, and so on, also add to the many benefits of buying a steel building from us. All our materials are sourced in Britain from UK Companies, which allows us to supply your structure faster, with minimum delay. Our steel framed buildings are designed to allow for a simple, fast erection at a fraction of the time that it would take for a more traditional structure. Expansion to existing buildings is straightforward and easy, so that your changing needs and requirements can be quickly accommodated. What if you need to relocate your business? Conventionally, this can be expensive, complicated, and time-consuming. The beauty of steel framed buildings is that they can be easily moved, should the need arise. This can save you huge amounts of time, energy, and money. In addition, these buildings are versatile and are ideal for workshop or storage solutions. We believe that you will find that all our steel framed buildings are very competitively priced. They can be custom-made to match your exact business requirements. Please feel free to contact us on our website today, by filling out our online enquiry form. You can also call us now on 0870 803 1965.